A group exhibition in which six installation artists engage a space beckoning with desire and opportunity. 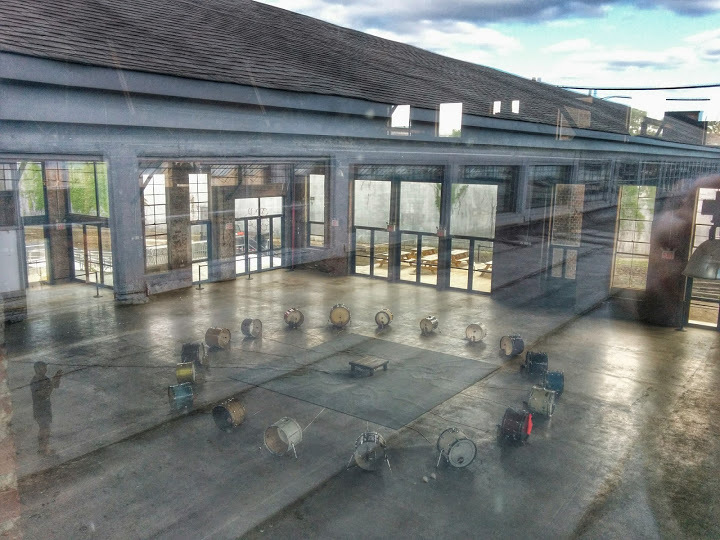 Knockdown Center's cathedral-like complex, with its breathtaking expanse, mysterious sub-chambers, surprise annexes, and hidden pockets, is a dream environment for site-specific and installation art. In addition, these works incorporate dynamic and time-based elements ranging from robotic interactivity to performance events to social intervention. Taken together, the architecture and the artworks transform the space into a surreal bazaar of curiosities for the adventurous. Opening June 15th, from 2-6pm. Special artist talk/tour at 5pm. The exhibition is open every Saturday and Sunday, from June 15 to July 6, 2-6pm. Click HERE to find out about the July 5th Performance Festival! 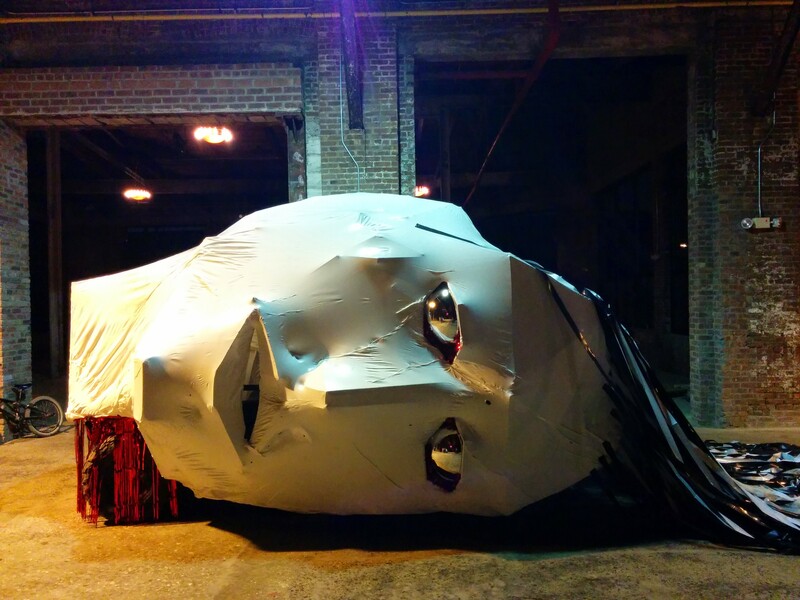 Hisham Bharoocha is a Brooklyn-based artist, focused on visual art, photography and music. 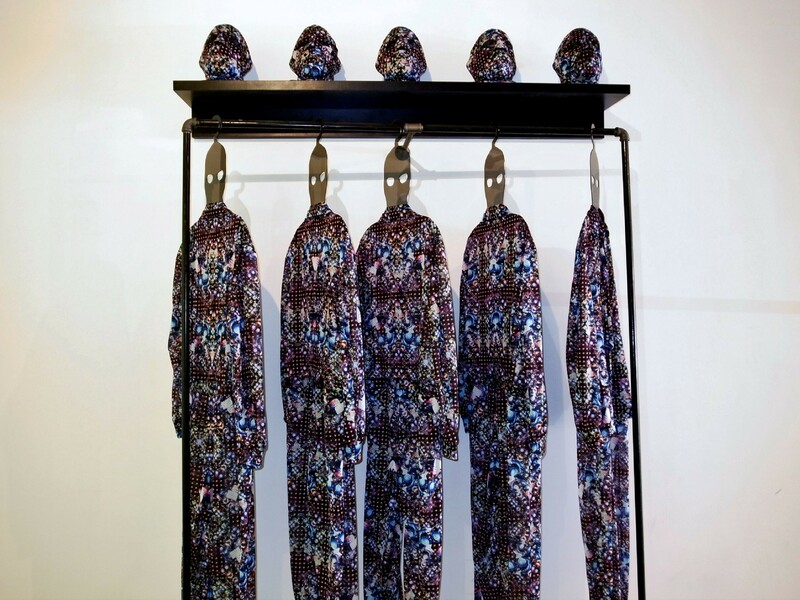 Bharoocha’s visual work seeks to materialize the images generated by the mind while meditating or dreaming. These creations illustrate the absurd confluence of the logic of our mundane lives and the parallel logic of the unconscious mind. 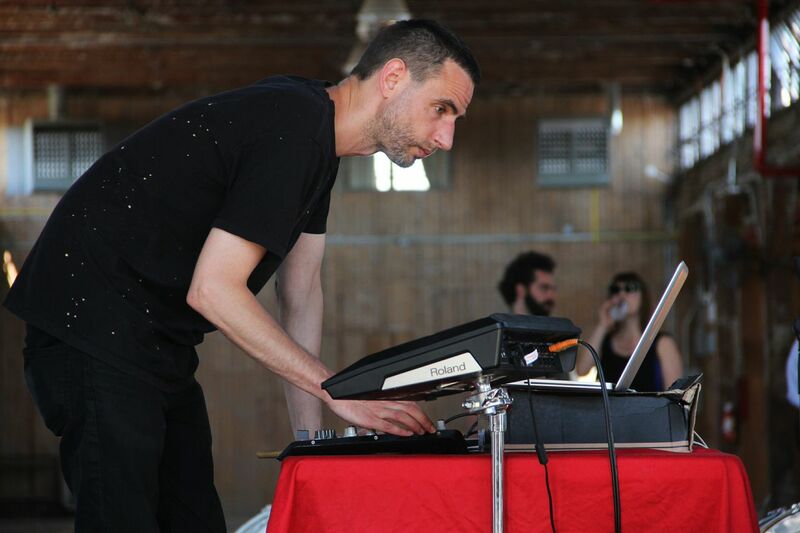 Hisham founded the bands Lightning Bolt and Black Dice, and his current solo project is called Soft Circle. Bharoocha has had solo exhibitions at D’Amelio Terras Gallery (New York) and presented work at the Vleeshal (Netherlands). See video below for Hisham Bharoocha in performance with IIII, a roving, concept-driven musical project involving anywhere from 4 to 40 international and local drummers. In this performance, the group appeared at Union Pool in Brooklyn, NY. IIII on 090411 at Union Pool from Cinecycle on Vimeo. Raul de Nieves is a large-scale figurative sculptor, narrative painter, ornamental shoe and garment designer, multimedia performance artist, and musician. 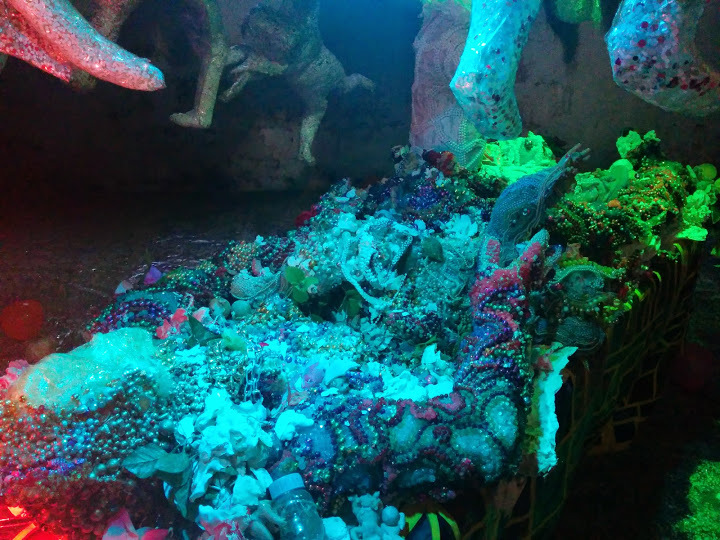 De Nieves’ sculptural shoes and installations are predominantly comprised of colorful, intricate beadwork and respectively act as prop and stage for his lavish performances. His work marries a fairytale aesthetic with subversive tones of rebellion, resulting in an experience of unearthly decadence. 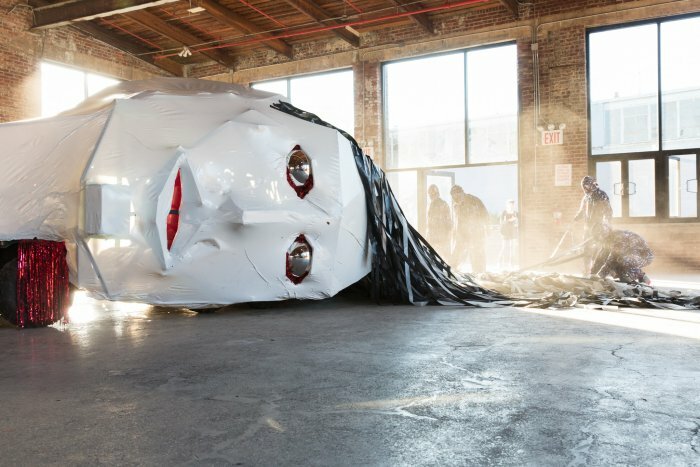 De Nieves’ performances have been exhibited at The Whitney Museum, MoMA PS1, MoMA San Francisco, and Performa. 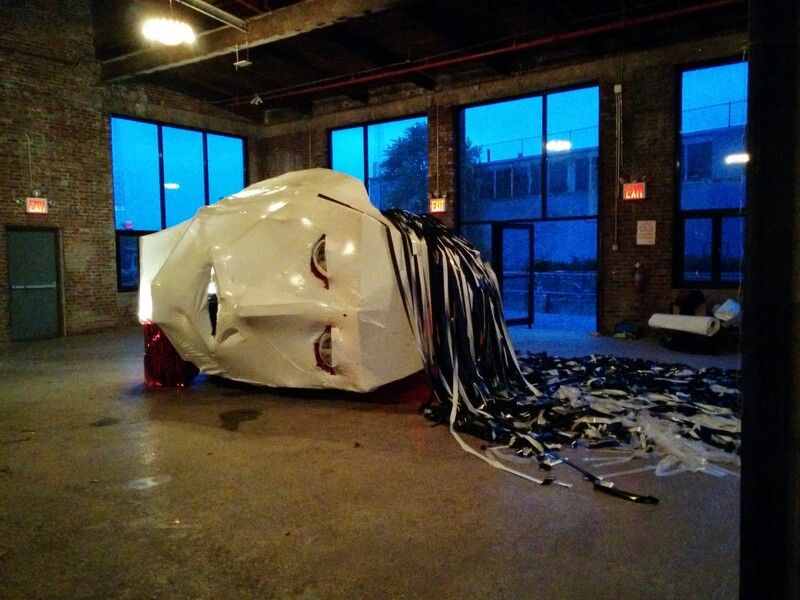 For Anxious Spaces: Installation as Catalyst, Raul de Nieves presented Celebration, an installation and performance. 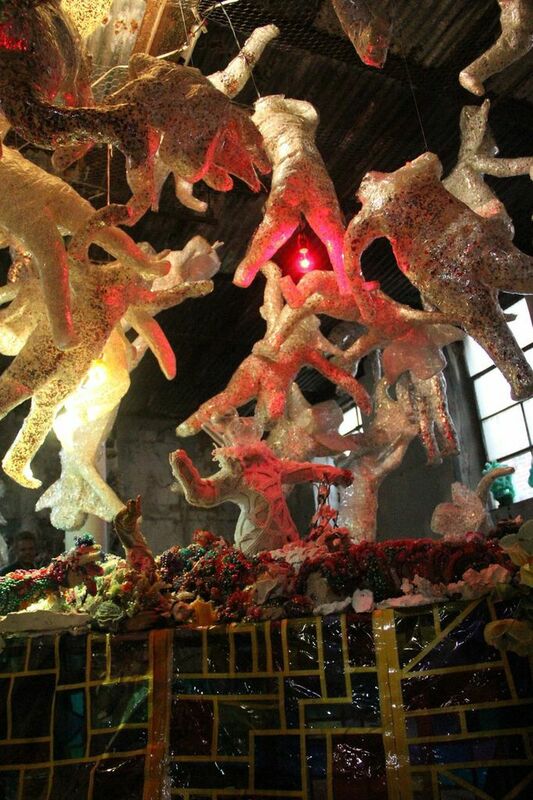 De Nieves created multicolored beaded and plaster sculptural works for the installation of Celebration. 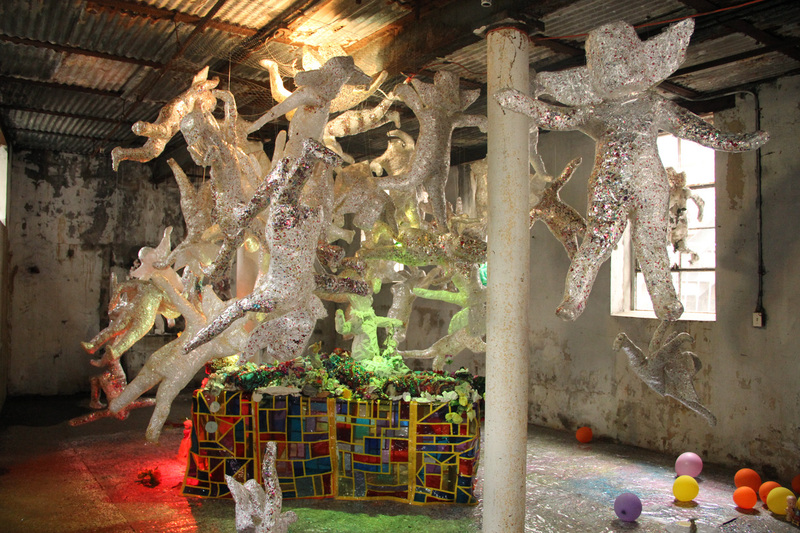 Winged children, representing the different stages of life, hung suspended in the air or gathered around the main alter piece where the bejeweled "Mother" sculpture rested. Awakening from his party tomb, howling spirits arose with de Nieves' unearthly incantations. Christian Joy is an American costume designer and artist best known for her stage costume designs for the Yeah Yeah Yeahs lead singer, Karen O. Often abandoning the traditional materials of thread and print, Joy’s pieces incorporate glue, marker pens, and found items, making her work influential in the punk and DIY style scene. She began her styling career without any formal training in fashion design, creating one-of-a-kind hand-painted/hand-sewn t-shirts and re-designing old prom dresses. 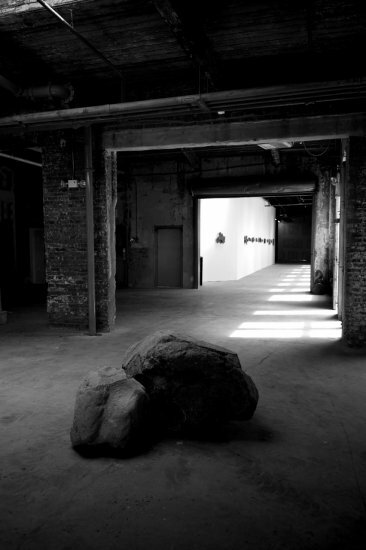 Joy’s work has been exhibited at Space 15 Twenty, Los Angeles (2009), Audio Visual Arts, New York (2009), and Secret Project Robot, Brooklyn (2013). For Anxious Spaces: Installation as Catalyst, DIY guru Christian Joy presented Bok Joy, an installation and collaborative performance. 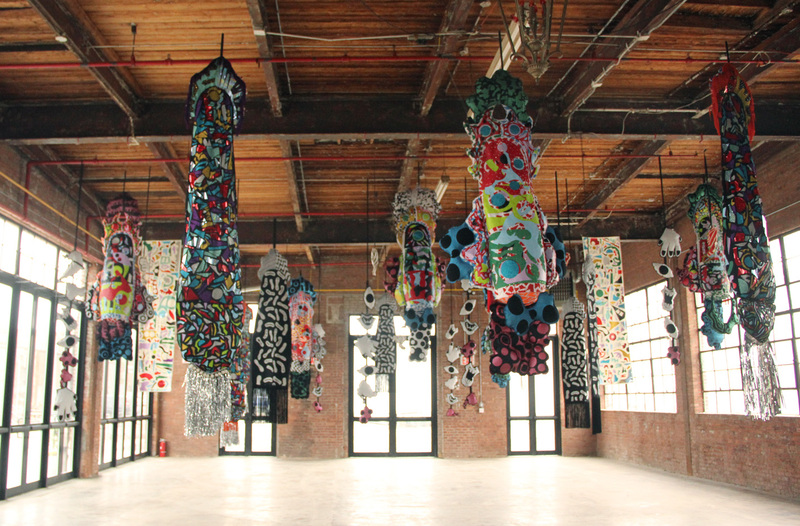 Joy installed larger-than-life hanging soft sculptures, that greeted visitors to Knockdown’s gallery space. Inspired by children’s bop bags and the work of Japanese film director Hayoa Miyazaki, these “characters” were constructed from vibrantly colored fabrics and incorporate textile designs, drawing on Joy’s experience as a costume designer. Joy's focus was on the independent movement of fabric. 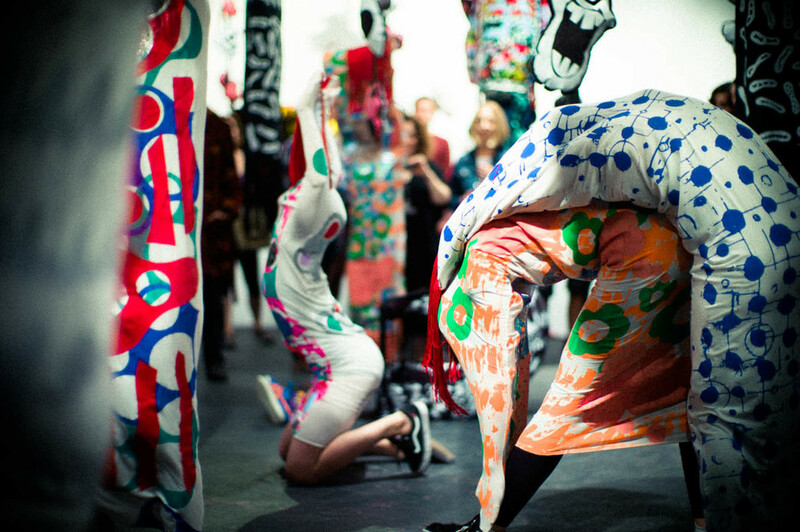 For the performance festival, Joy’s installation was animated by musician Bubbles and the dance troupe Accidental Movement. 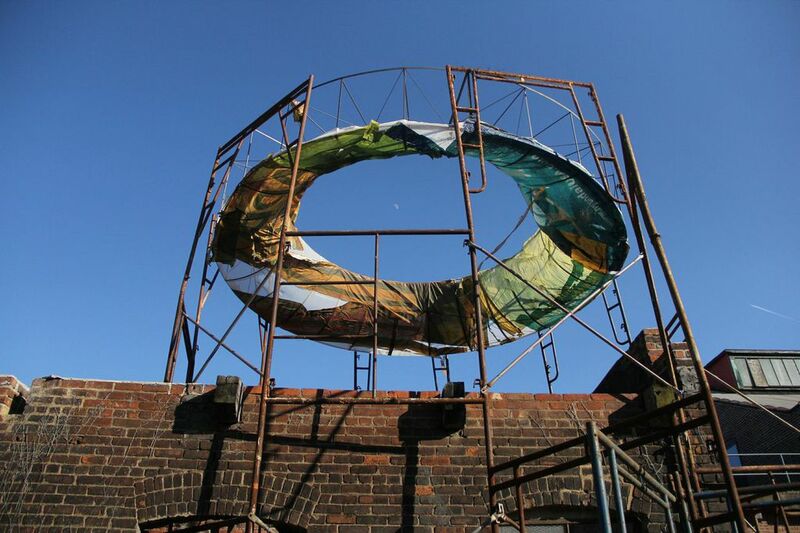 Ben Wolf is an installation-driven, large-scale site-specific sculptor. 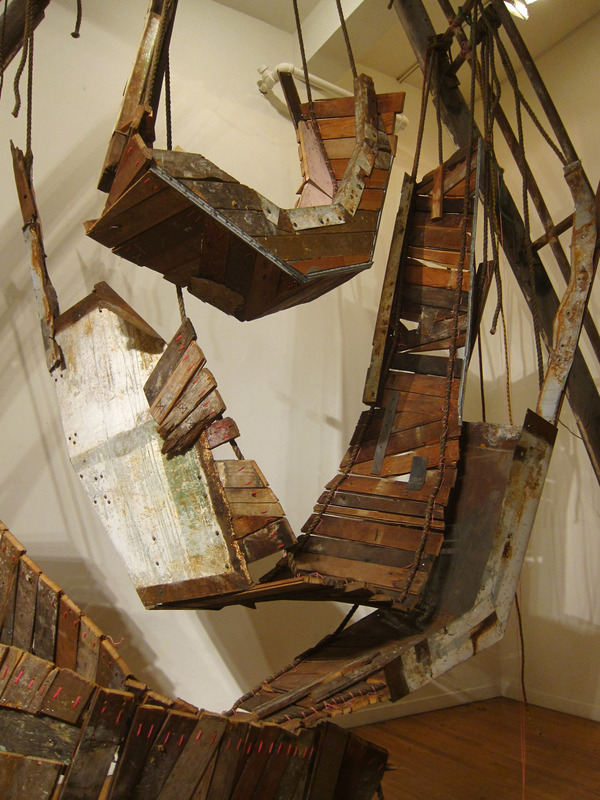 His work incorporates rotten boards, rusted stair wells, peeling paint and other objects of decadent abandonment. 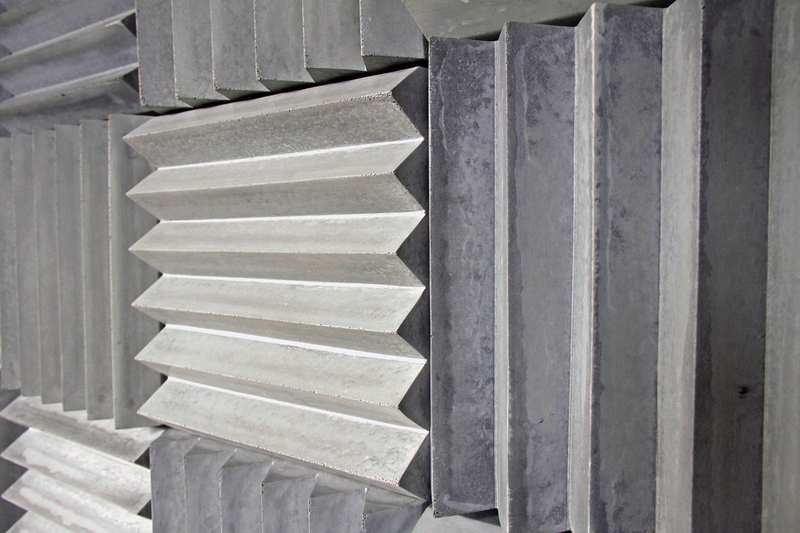 Combining the techniques of carpentry, welding, and casting, and a process of adding, stacking, and layering, he simultaneously embraces and arranges the chaos of his materials. Wolf has exhibited his work at the Rabid Hands Collective (Detroit), Secret Project Robot (New York), and MU Eindhoven (Holland). 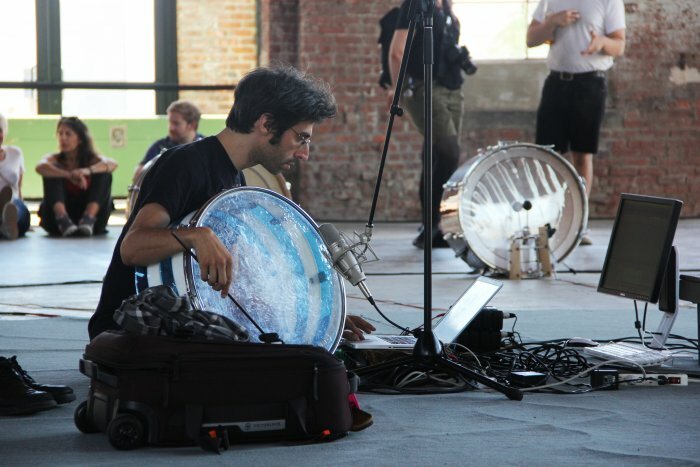 Ranjit Bhatnagar is a sound sculptor who works with technology, language, and found materials to create interactive installations and musical instruments. 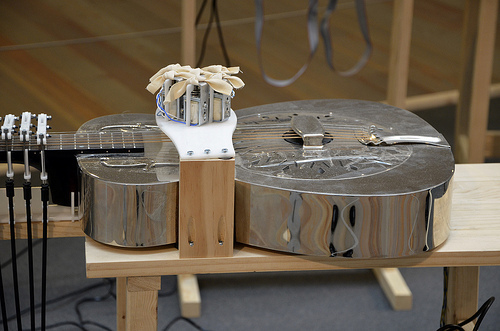 Bhatnagar’s projects include his ongoing Instrument-A-Day series, in which he creates a new homemade musical instrument every day throughout one month of the year. 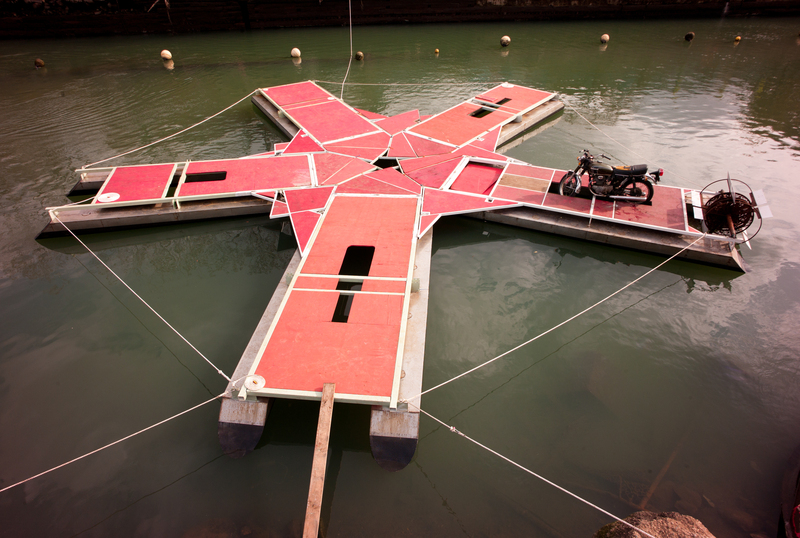 His works have been exhibited at the Lawrence Hall of Science in Berkeley, Flux Factory in Queens, the Pratt Institute in New York, and the Mermaid Show at the Williamsburg Art and Historical Center in Brooklyn. 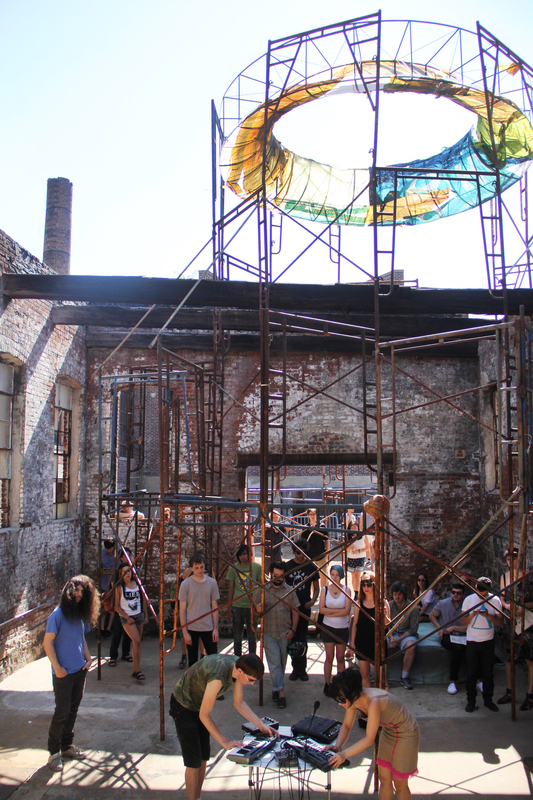 Bhatnagar taught “Mister Resistor” at Parsons School of Design, a studio course and rock band with homemade instruments. 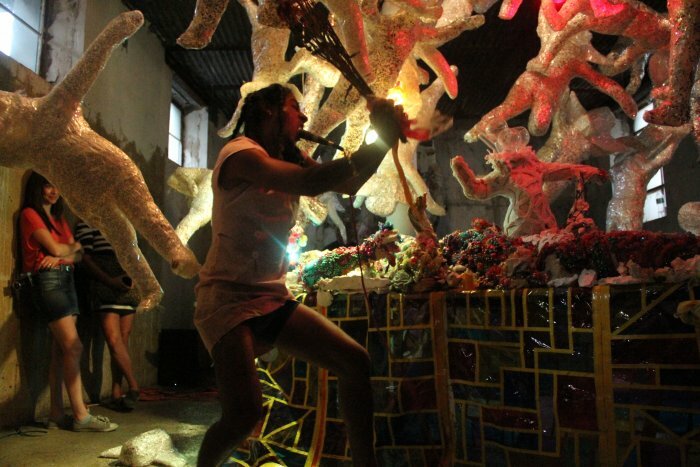 Desi Santiago is a Puerto Rican visual and performance artist based in New York City. 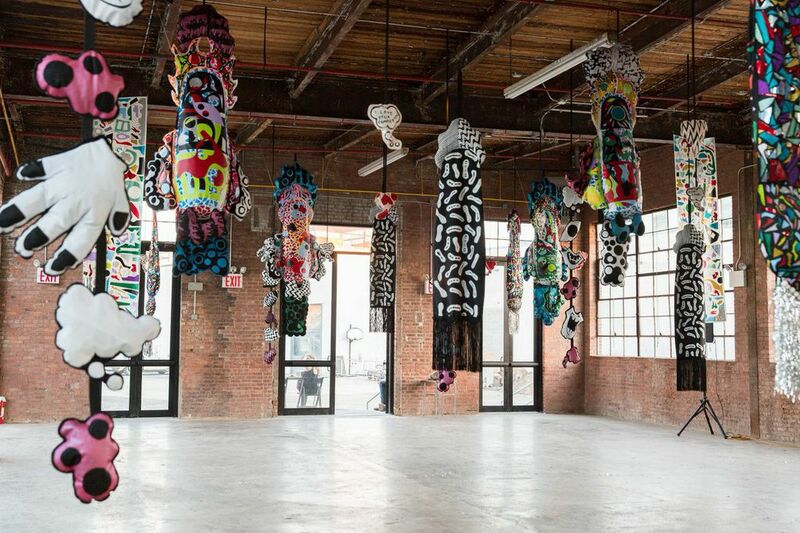 Santiago’s work is inspired by the relationship between the subculture of the New York City nightlife scene and the fashion and fine arts worlds. His performance pieces similarly reflect this aesthetic theme, in their focus on the dual ritual of mourning and celebration. His large-scale installations often serve as a theatrical platform for his exploration of the body as “host” for experience and identity. Santiago received an MFA from Bard College. 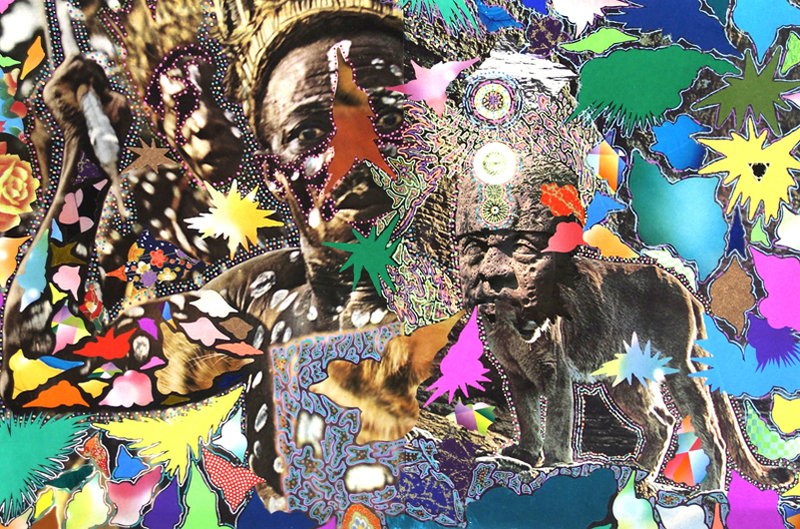 His work has been exhibited at the Matthew Marks Gallery, MoMA PS1, The Metropolitan Museum of Art, the Museé des Arts Decoratifs, Paris, and Art Basel Miami Beach. 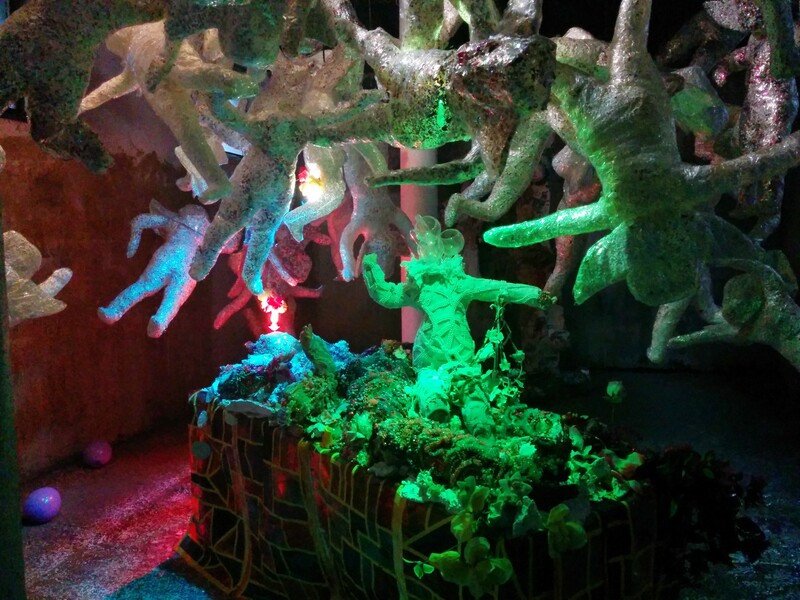 For Anxious Spaces: Installation as Catalyst, nightlife subculture explorer Desi Santiago presented Mummy Procession, an installation and performance. 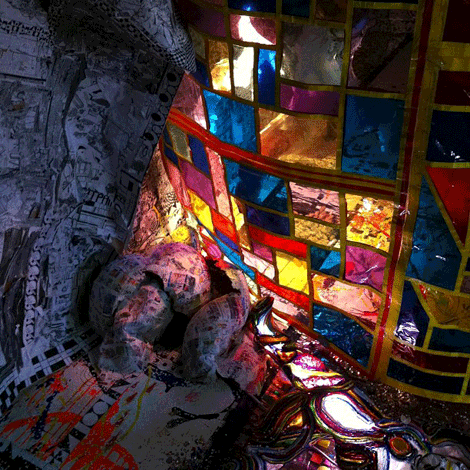 Santiago created a massive fallen idol, an all-white mummy with mirror eyes and flowing hair. 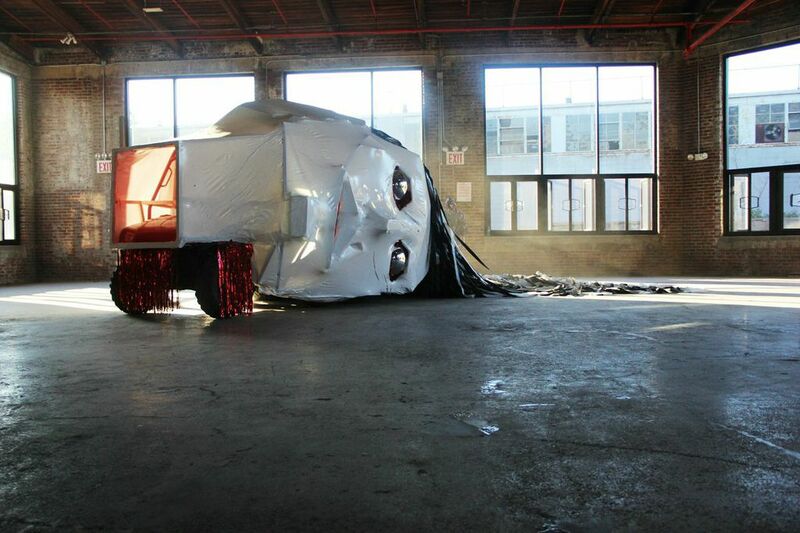 The decapitated head lay in Knockdown's great hall until the time of its grand procession came, at which point the ceremonial parade through the property began, costumed attendants following the ghostly head float in its wake. VnessWolfCHild (Vanessa Cronan) croons to the audience in the Coliseum of Bliss Tint Token, a massive sculpture built by Ben Wolf as an homage to joy. 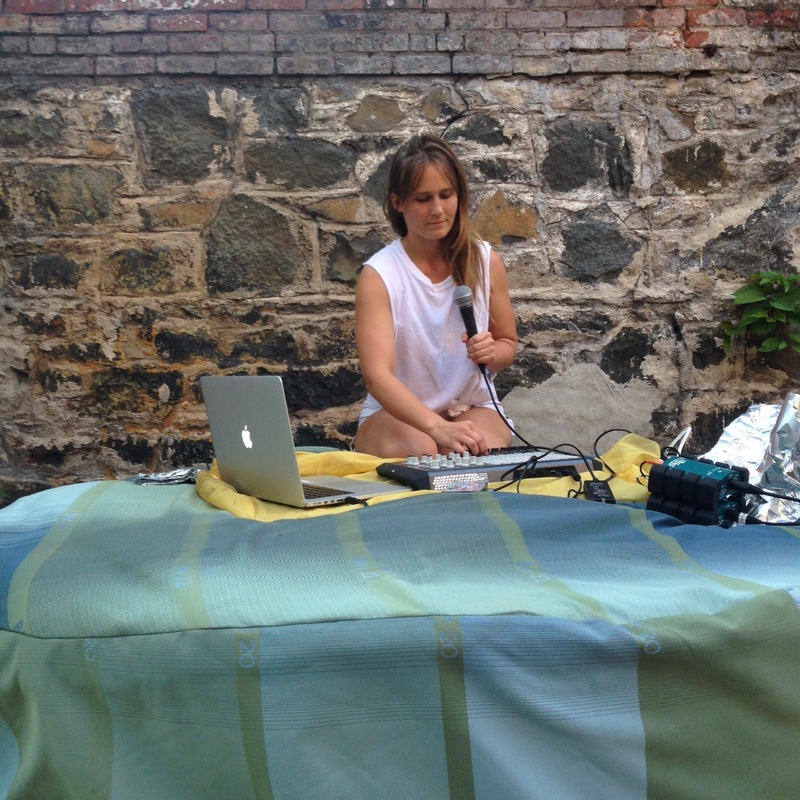 Psychedelic, interactive songs like I Love My Body float into the hot summer air in this live set, staged for the Anxious Spaces: Performance Festival at Knockdown Center. 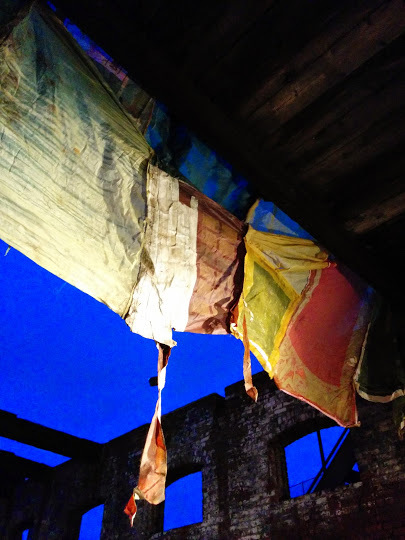 Trabajo, the project of electronic sound artists Yuchen Lin and TJ Richards, features an an intermix of musical genres including gamelan, exotica, folk, and noise. 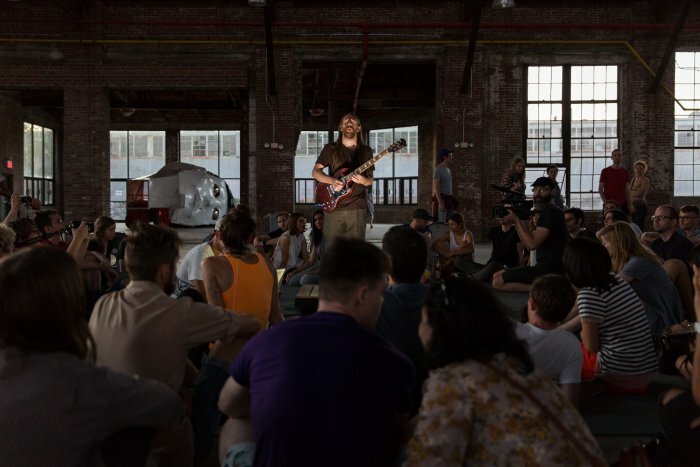 In this recording, the artists play live in the Coliseum of Bliss Tint Token installation by Ben Wolf; their performance is a part of the Anxious Spaces Performance Festival at Knockdown Center. 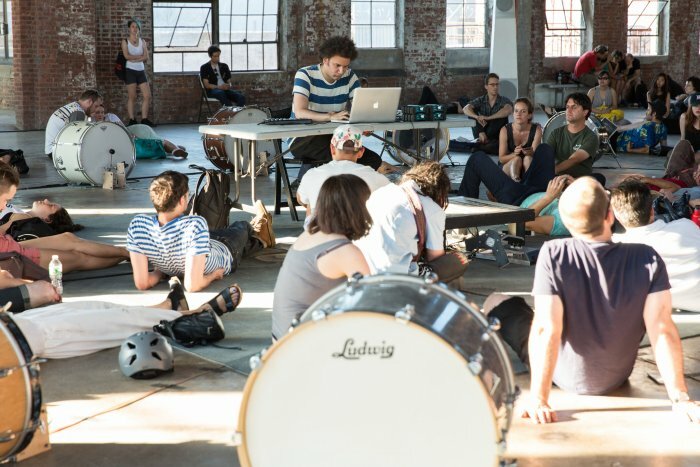 In this live recording from the Anxious Spaces Performance Festival at Knockdown Center, experimental, multi-instrumental musician Tyondai Braxton performs a piece designed to play in tandem with the drum circle installation Zero to 0 by Hisham Bharoocha and Ranjit Bhatnagar. Braxton's music focuses on "orchestrated loops," a real-time overlaying of guitar, voice, and found objects designed to simulate an ensemble. He was formerly the guitarist, keyboardist and singer of the experimental rock group Battles. 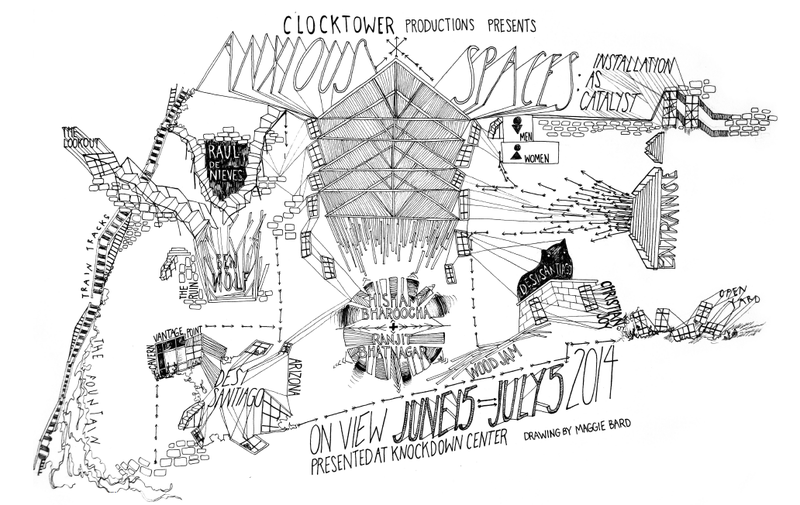 Raul de Nieves awakens from his party tomb in this recording of the magical and mystifying artist performing live in his own installation Celebration for the Anxious Spaces Performance Festival at Knockdown center. Howling spirits arise with de Nieves' unearthly incantations. 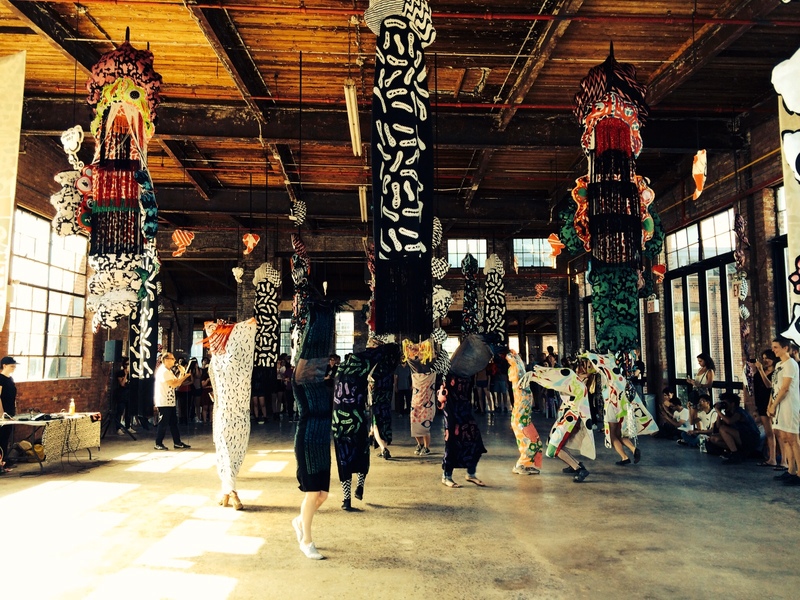 Live performances by Aurora Halal, Lucas Abela, and Prince Rama, who use video, sculpture, and sound artwork in site-specific installations at Knockdown Center as a point of departure for their exploratory performances.